The game Smash + Grab was only just released a few weeks ago on September 27th, 2016. However, it’s already no longer available for purchase from the Steam store amidst reports that developer United Front Games has shut down. Smash + Grab is a little bit like an MMO version of Rockstar’s The Warriors, fused with Vogster Entertainment’s CrimeCraft and a little bit of Reloaded Production’s APB: Reloaded. It featured gang-on-gang multiplayer violence with melee combat and teams just like The Warriors, but you could smash and grab things by looting nearby stores just like in APB: Reloaded. There was a crafting and customization element available as well, just like CrimeCraft. The game received a lot of high praise from game critics and gamers alike for its solid fighting mechanics, unique concept and techno futuristic aesthetic. Well, the forums have been ablaze over the past couple of days as gamers have realized that there’s no longer a buy button on the store page and there’s been nary a peep from the developers. Gamespot reported that someone close to United Front Games have acknowledged that the studio has shut down. 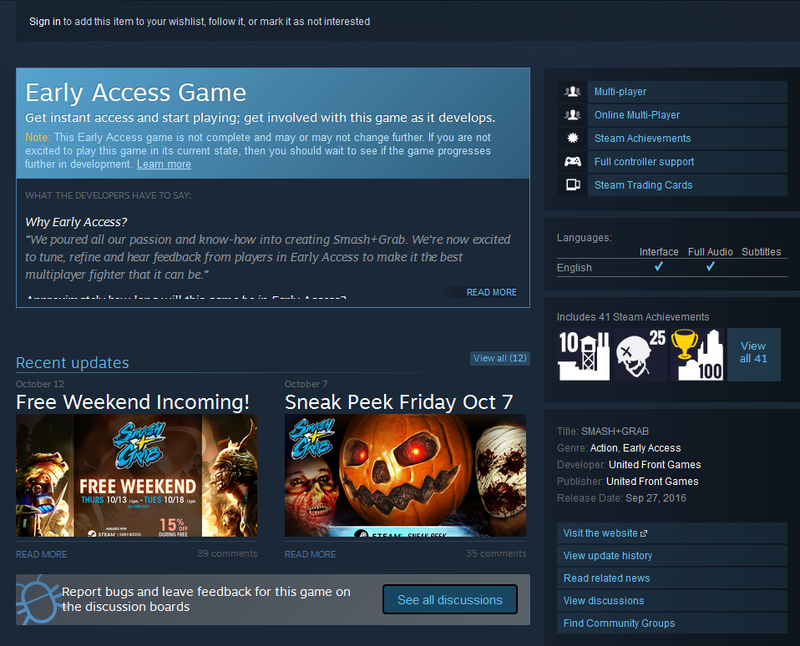 It all comes out of the blue, and even more-so, comes out of the fact that they literally just had a free weekend taking place between October 13th and October 18th. “Since our Early Access launch, we’ve patched the game 7 times and made 63 big improvements, including Crew Commands, crash and bug fixes, optimisations, gameplay and matchmaking tuning, and the addition of new unlockable items. For those hoping that the game could still be playable even without the buy option and even with United Front biting the dust, there are reports on the Steam forums that even those who own the game can’t play it because the servers are offline. Anyone who put money into Smash + Grab should try to get a refund before playing for two hours, according to some users they did have luck in getting the game refunded. “A huge thank you to everyone who played and bought Smash + Grab over the last several weeks. We hope everyone had a great time playing. “As we will not be doing any further development or support, we have asked Valve to make refunds available to any owners who request them, regardless of how many hours played.